→How To Do Screen Printing On Plastic Bags At Home? ​Did you know that it is actually the simple things that make you stand out? Perhaps you have met someone in the streets carrying a plastic bag with such unique designs that you wished you had one like that. But bringing out your uniqueness with a plastic bag is not as difficult as you’d imagine. All you need is to know how to screen print on plastic bag, and that’s what this article is about. Read on and discover how to customize your plastic bags through screen printing. First, there are several methods you can use to print plastic bags. The correct method depends on the size, type, and quality of the bag among other reasons. Flexography is one of the methods you can use. With this method, you impress a design on rubber printing plates that let the ink pass through to the bags. Aside from flexography, there’s the method we’re interested in – screen printing. Even though screen printing allows for the printing of only one bag at a time, the method is fairly fast. Moreover, it’s very easy and inexpensive, and most of all, it produces awesome results. So, what does screen printing involve, you ask! With this form of plastic bag printing, ink is transferred to the bag through a mesh. Ink is thoroughly spread throughout the screens, and it fills the little holes in the mesh. You also need a dark room to work from. After getting these tools and supplies, it’s time to go through the actual steps. Prepare the graphic. You can do this on a computer using software like the Adobe Illustrator and keep in mind that designs with simple lines are a lot more effective. After that, print the graphic on a heat transfer vinyl. Study the design carefully and be sure to remove any errors. After that, cut the image on a stencil and soak it in the emulsion. Put the cardboard papers in each bag you want to print, so the ink doesn’t seep to the other side of the plastic bag. Remove the stencil from the emulsion and position it suitably on the spot where the design is going to appear. A tape will be very useful for stabilizing it. Use the popsicle stick to pour the ink on to the stencil and use the squeegee to spread the ink all over the stencil. As you move the squeegee back or forth, be sure to cross the image as much as you can so it can be transferred to the plastic bag. Again, don’t use force while working the squeegee; you want to use just a little pressure with gentleness. Remove the stencil and check the printed image on the plastic bag. In case it’s not as clear as you’d want it to be, place the bag under the stencil once again and spread the ink over the design using the squeegee. It’s okay to repeat the process several times to attain a good printing. If you inspect the bag and see that the design was transferred as you wanted, take off the entire stencil and place it on the canvas before washing it with some water. And as for the plastic bag, place it where the image will dry or even use a blow dryer to speed up the drying process. So, as you can see, there’s really no need for a plastic bag printer machine when you need to print your own plastic bags on a small scale at home. Now, we’re going to discuss a few terms you should know about plastic bag screen printing at home. But before that, how about some tips to make your work easier and help you do screen printing on plastic bags successfully? Print just one color – ensure you’re printing a dark color on a light-colored bag and vice-versa. As you cut out the stencil, be sure to cut the white rings only and leave the red ones for the stencil to cover. If you use a transparent paper, be sure to use black ink. These are for customizing the bags, and they last around 3 years with good maintenance. The size of your printing plates should depend on the size of the plastic bags you’re looking to print. When you want the position of the printed graphic to remain the same, registered printing is what you need to do. To pull that off, you have got to use the same printing plate size, the same image, and the same kind of bag in terms of both design and size. This is where the image appears multiple times on the bag without the image necessarily being the same. Observing the following guidelines/tips will help you avoid making a mess when printing on plastic bags. Make sure you define the size of the bags you’re printing. Specify the colors you’re going to use and the entire design of the printing beforehand. In case someone else is printing the bags for you, be sure to send them the designs early enough, so they have plenty of time to prepare. 1. 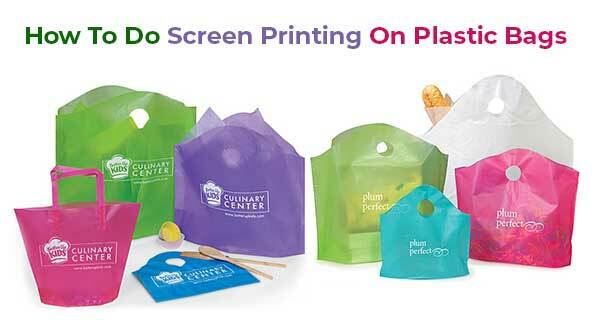 Can you screen print plastic bag? Yes, certainly. Screen printing on plastic bags isn’t much different from screen printing on garments; the process is the same. 2. Is screen printing plastic bags profitable? This process is ideal for customizing plastic bags for malls, boutiques, supermarkets, and other shopping outlets that need packaging bags, and so it’s a great business opportunity. Of course screen printing plastic bags is profitable but as with any other business, strategizing is essential. 3. Are screen printed designs on plastic bags durable? Screen printing is one of the best printing methods, and in fact, its designs are even more durable than digitally printed designs. The printings should last years. Screen printing on plastic bags is that easy. So, you don’t need to pay all that money having your plastic bags printed anymore. And after printing your own bags, you can even start printing for other people and make it a part-time or fulltime business. Did we leave anything out that you’d like to add? Why not do so in the comments?